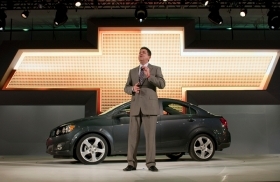 Chevrolet's Chris Perry will become vice president of U.S. marketing on Feb. 1. He introduced the Chevy Sonic at the Detroit auto show last week. DETROIT -- A month after taking over General Motors' global marketing, Joel Ewanick has named a new U.S. marketing chief and shuffled his leadership at other GM brands. Chris Perry, Chevrolet's marketing boss, will become vice president of U.S. marketing overseeing GM's four U.S. brands, the automaker said today in a statement. Ewanick held that same job until mid-December, when he became global chief marketing officer, a new position. The changes take effect Feb. 1 and align Perry more closely with Ewanick, two executives credited with boosting Hyundai's image in the United States until their move to GM last year. In August, Ewanick plucked Perry, 50, to steer a campaign that seeks to exploit the deep ties between Chevy and U.S. buyers. “These moves support our plans to continue building very clear and distinct swim lanes for our four brands,” Ewanick said in the statement. • Rick Scheidt, 57, executive director of Chevrolet product marketing, will take over Perry's job of vice president of Chevrolet marketing. He's been with GM since 1980, mostly in marketing positions at Chevy. • Tony DiSalle, 46, will become head of U.S. marketing for Buick. He has overseen marketing for the plug-in hybrid Chevrolet Volt. • John Schwegman, 46, who was named vice president of U.S. marketing for Buick and GMC in March, will remain head of GMC marketing. Perry will be GM's fifth U.S. marketing chief in the last 18 months. Scheidt becomes the fifth marketing leader during that stretch for Chevy, GM's largest division. The latest moves come as GM's four remaining brands are rebounding. Chevy's U.S. sales grew 17 percent last year, while GMC was up 32 percent. Cadillac rose 35 percent, and Buick jumped 52 percent. GM's total sales were up just 7 percent in an overall market that advanced 11 percent, reflecting the shedding of four brands. Last month, under Perry's direction, Chevy launched a yearlong series of weekend test drives at dealerships dubbed “Mainstreet in Motion.” Each event invites a few thousand would-be buyers to compare Chevy vehicles with Toyota, Ford, Honda and other brands. 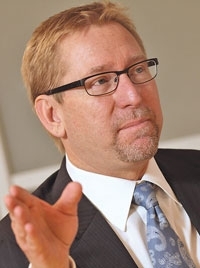 Perry had been with Hyundai for 10 years before he was named the South Korean automaker's top U.S. marketing executive last March. He replaced Ewanick, who left that post for a brief stint at Nissan before joining GM in May. Hyundai dealers credited Perry with attention-grabbing campaigns. One example: the Hyundai Assurance program, launched during the depths of the recession, which guarantees customers that they can return their new car if they lose their job. Hyundai was one of three brands to boost U.S. sales in 2009, the weakest year for demand in 27 years.